Discussion in 'Ask The Pros' started by Kurtis Long, Apr 7, 2019. We went to a counsel race yesterday and I noticed that my sons car was way more consistent then the the two cars that beat him in the final. It looked like his car was more stable going down the track but still not quite fast enough to win. My son was running 2.940s and the two guys ahead of him got into the 2.939 and one 2.938. So if his car is more stable but slower would it be a wheel prep issue? Cog was around 3/4” and we ran about 2” to 3” of stear over 4’. The other possible issue was the car was a touch under weight. I was a little worried about how different their scale would be then ours. There scale said we were 4.94 so a touch under. Was that possibly the difference? I don’t think .06 at that level is much of a difference maker, tho I could be wrong. With good steer, no wiggling... prep would be the next thing I would look at. But I’m also no pro. Just giving my 2 cents. Really good prep could easily over take any advantage .06 oz in weightnwould give I would think. There was a bit of speed to gain with adding that last 2 grams. Hard to do at check in, but something like chips and scotch tape and a bit of metal tape over them can make that last bit easy to get. Extra weigh gains you 0.001 sec. Now if you are running 0.75" COG, you can probably drop that down to 5/8" and still be very stable. That would pick up another 0.0012 sec. Altogether, with the same prep you had, you could have picked up 0.0022 sec. 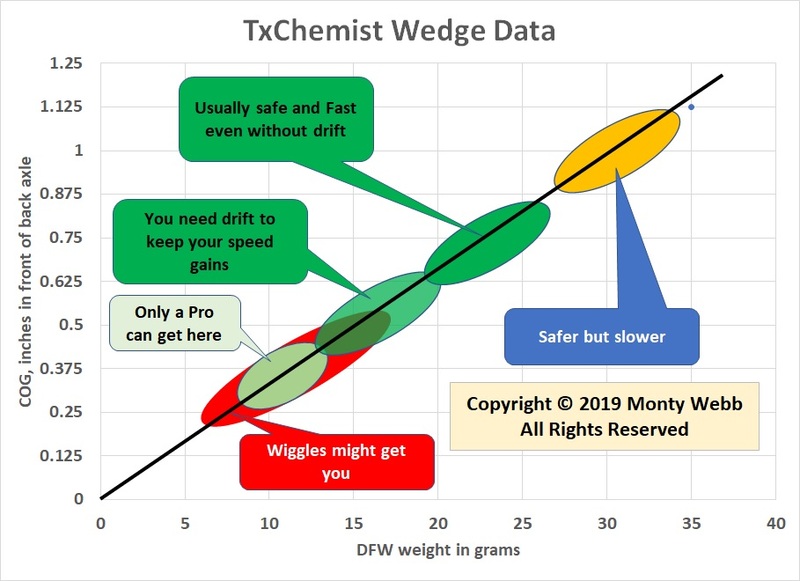 Get a scale and change from COG to weight on DFW to get a better idea of whet drift to dial in and what is safe to run. Wedge data I show might need slight mods for each racer, but you get the idea about what you can do and how to tell where you are. There might be other adjustments like wheel spacing that could improve your time, and improving prep is always a great goal, but mechanically, you can get tighter to the optimum. The chips photo shows a whole 10 grams added with thin chips of tungsten only 1mm thick. Wolfram Racing and Kurtis Long like this. If your car was that stable it’s quite possible you could have gone with a little less steer & been right there with them. Tough call though trying to find that fine line that pushes you too far & of coarse wiggle. Keep working on your prep. If you don’t have a track to test on, try sending in to a league race, you’ll figure out a lot! I wish I could share the videos I have of our races on here but it don’t seem to let me upload them from my phone. Best way I found was to upload my vids to YouTube and then link them here. I posted vids of all our adventures dominating in Awana Grand Prix the last 3 years doing it that way. Love the graphs TX...question, what was the assumed wheelbase for this graph? Assuming you have moved the back axle back to 5/8" from the typical 7/8" location, but wheelbase is 4 3/8", but the idea of how light you can get on the DFW is a guide. txchemist, if you ever have time to run it, would love to see where the suggested bubbles would be with a kit wheelbase (without moving a slice from the back to the front). So if I’m following correctly . . . Would you expect the “you need drift to keep your speed gains” bubble to stay in the same range on a kit wheelbase (and distance from rear) car because measuring the DFW will inherently account for the rear axle location? (As an aside, I think moving a bit from front to back is literally within the pack’s rules but would be seen as being overly competitive. Probably not worth it in my case because I would expect my son’s car to win his pack regardless). Yes, exactly. 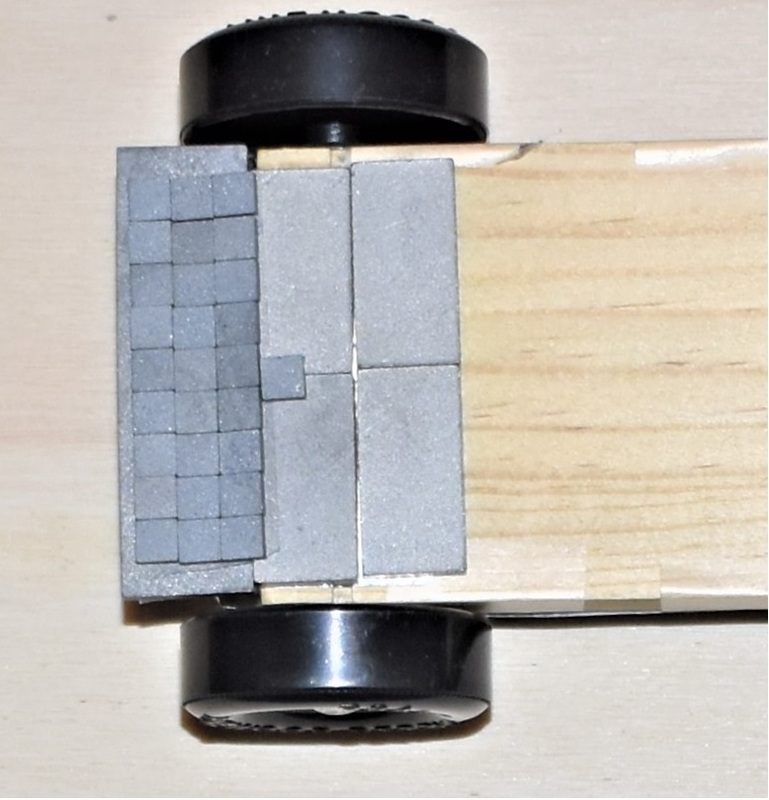 Are you prohibited from bending an axle so you are looking to build without drift? Here is the link to the videos of the runs from the weekend. The first race I could only get the side shot. There was tons of people there. Then in the championship race I got some down trac shots. After watching the down track videos over and over I do see some wiggle I believe. I think I just didn’t notice it because all I could see was how much the other cars wiggled. I also noticed when our car was all the way to the left there was a huge bump down the track. I’m surprised more cars didn’t jump off let me know what you think. I’m all ears. 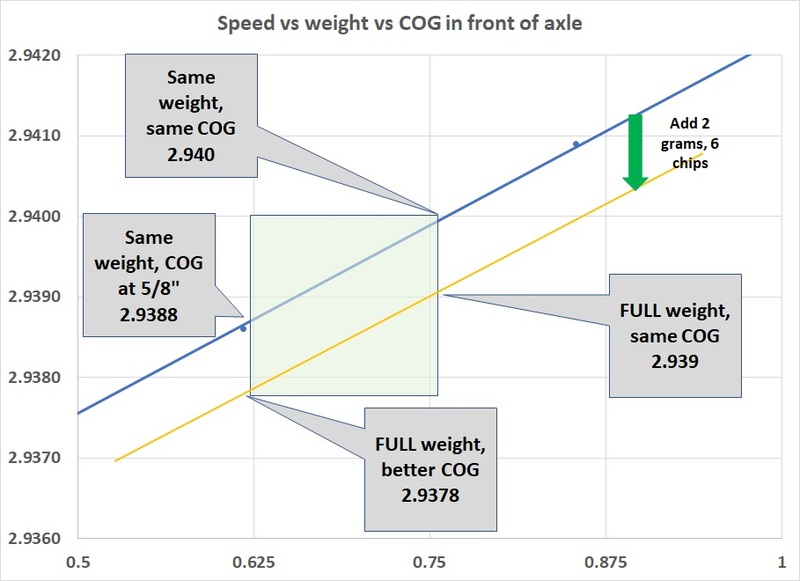 No, I am allowed to bend an axle, I'm just trying to figure out how to balance aggressiveness with stability, and most discussions on here about more aggressive cogs or DFW weight are assuming a different wheel base. My son has been in scouting for two years and he's come in second in the pack by a few thousands both years to the same scout, using bent DFW and rear axles. Between that scout crossing over, us buying a drill jig for canted axles, and various other improvements, my son should already be the favorite next year. So I want to figure out how much we can push the DFW without unreasonable risk that some wiggles slow him down enough to keep him out of first. As I mentioned in another thread, we've been experimenting with body designs and I don't think he needs a ladder car. He can get the DFW down to 13-14 grams with a solid plank, one of your weights in back, and cube weights just in front of the rear axle. What I was unsure on is whether 13-15 grams is too aggressive with the unmodified wheelbase (plus no ability to test on a track, though we will use a tuning board).